Charlotte Rae's career spans more than seventy years, from the golden age of television to Shakespeare in the Park, the New York Cabaret scene of the late 1940s and 50s to her hit series, The Facts of Life and well beyond. Off stage and screen, Charlotte's life has been of joy and challenge, raising an autistic son, coming to terms with alcoholism, the heartache of a broken marriage, the revelation of a gay husband and the sudden challenge of facing middle-age with financial and emotional uncertainties--an crisis she ultimately turned into the determination that brought her stardom. 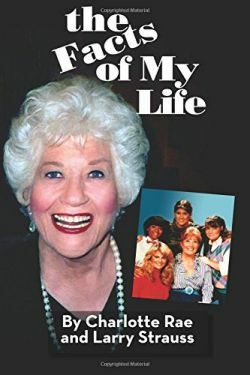 The Facts of My Life is written by Charlotte Rae and her son, Larry Strauss. It's the first opportunity for Charlotte fans to explore the fascinating story of her extraordinary life; poignant and hilarious, a story of courage and triumph, one that speaks for a generation of women breaking barriers, taking on challenges, overcoming personal tragedy, and paving the way for others. The early chapters of the book focus on her childhood in Milwaukee, Wisconsin. She talks about how her parents, Meyer and Esther, first met. Charlotte Rae Lubotsky was born on April 22, 1926, in Milwaukee. Her father owned a tire store. She has two sisters, the late Beverly and Mimi. Beverly and Charlotte were always very competitive with each other. They didn't always have the best relationship until their later years. She talks about her family often throughout the book. Rae attended Shorewood High School where she became passionate about theatre. She discusses her time at Northwestern University where she studied acting. Her classmates included her future Facts of Life sister Cloris Leachman and Paul Lynde. Leachman and Rae also shared an apartment in New York City for a time. Rae talks about changing her last name and how it upset her father. She discusses her early work as a saloon and cabaret singer when she was making $60 a week. Much of the book details her work as a stage actress. She received two Tony nominations for her roles in Pickwick in 1966 and Morning, Noon and Night in 1969. She shares many behind-the-scenes details of her work in various plays and musicals. Rae gives much praise to many people she worked with, but she's also not afraid to talk about a few people she found difficult to work with. She married composer John Strauss on November 4, 1951. They had two children together, Andy and Larry. She provides many stories about her sons sprinkled throughout the chapters. Her son, Andy, had autism. They struggled to get him help as not much was known about autism back then compared to today. She also discusses her husband coming out as bisexual and their divorce in 1976. Other struggles she discusses in detail include her battle with alcoholism and various health problems. She's had sobriety for over 40 years. She's also a pancreatic cancer survivor. Rae provides many details about her television work throughout the book. She talks about her guest appearance on The Phil Silvers Show, which her husband worked on in the sound department. She briefly talks about her role as Sylvia Schnauser, the wife of Officer Leo Schnauser (Al Lewis), in Car 54, Where Are You? In 1975, she starred as Mrs. Bellotti in the short-lived Hot L Baltimore. 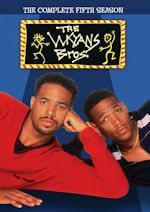 She that this was Norman Lear's favorite series, interestingly enough. She shares a story about her appearance on All in the Family as the tupperware lady, Miss Lillian Henderson. Her time on Diff'rent Strokes is discussed in a chapter titled Strokes of Good Fortune. She talks about how about she almost didn't play Mrs. Garrett because she was under contract with CBS at at the time. She has some nice things to say about the cast members, but she thought the parents were problematic. It's interesting that she didn't really enjoy her time on the series very much. She was concerned they were phasing her character out by giving her fewer lines. The Facts of Life is talked about in parts of two chapters. Rae has given many interviews over the years, so there is probably not much new information here for the die-hard fans. Topics she discusses include how she discovered Mindy Cohn, the first season cast, her weight loss after the first season, her favorite guest star and her decision to leave the series. She also talks about her favorite trip to Paris when they filmed The Facts of Life Goes to Paris. I thought it was a little surprising that she didn't mention the 2001 reunion movie at all. The final two chapters detail her life after The Facts of Life. Despite some health struggles in recent years, she has continued to have roles on television and in films. Most recently she had a small role in Ricki and the Flash. There's a nice section of over 75 black and white photos in the middle of the book. She provides captions of the many photos of her family and from her show business career. 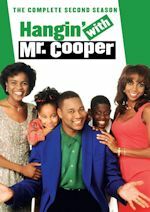 There is one with Gary Coleman and Todd Bridges. Several Facts of Life cast photos and one with Geri Jewell are included. These are fun to see, so it's great that she shared them. Her career highlights and acknowledgments are presented at the end of the book. 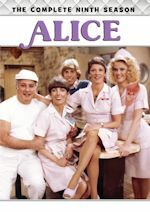 If you're a fan of Charlotte Rae, this is a must read. There's only a limited amount of information on her available online, so this book provides her complete life story from her early childhood in Milwaukee up to the present day. They do a nice job of blending in the details of her personal life with her professional career. There's a good mix of comedic and dramatic sections. She also shares some pretty wild stories, such as the first time she smoked pot! It's easy to picture her as Mrs. Garrett, but she has a bit of a mischievous side. Fans of The Facts of Life may be a little disappointed that only two chapters are devoted to the series, but I think it's a fair amount. This wasn't meant to be a tell-all book on the series. She talks about many of the highlights and has many good things to say about the cast and her time on the show. The book is well written. It provides all the facts you could ever want to know about Charlotte Rae. It feels like she is almost talking to you as she shares many funny and heartbreaking stories. She has an incredible memory to recall so many names and details. She has overcome many struggles in her 89 years. I don't think you have to be a fan of The Facts of Life or her other work to be inspired by her life story. She seems like a very sweet little woman. She has been blessed to live a long and productive life. Hopefully she has many more healthy years and projects in the future. We have been blessed to have her bring us so many great laughs and memories over her 70 years in show business. 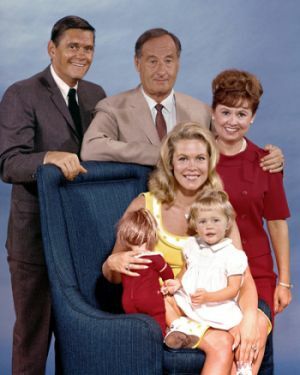 TV Land has re-added Bewitched to its lineup. The classic '60s sitcom is airing on the network weekdays from 5-6pm replacing an hour of Gilligan's Island. 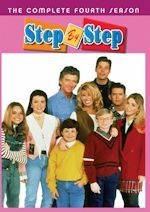 That sitcom will continue to air in the mornings from 10am-12pm following Three's Company which moves to an earlier timeslot replacing I Dream of Jeannie. So essentially, Bewitched is back, and Jeannie is out. The rest of the TV Land line-up will remain the same including The Facts of Life every weeknight from 6-8pm. Both Bewitched and Jeannie will also continue to air on sister Viacom network Logo. Keep it right here for continued updates.